Longtime Washington Broadcaster Eddie Gallaher passed away Wednesday, November 26, 2003 at age 89. 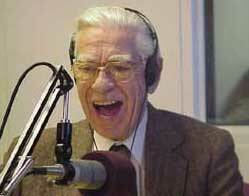 Eddie came to Washington in 1947 and soon replaced New York bound Arthur Godfrey on WTOP-AM's Sundial morning show. Within a few years Eddie was the biggest media star in DC, on WTOP AM, FM, and TV-9. In 1968 Eddie and others offered to buy WTOP-FM from the Washington Post. When the Post donated the FM to Howard University, Eddie moved to MetroMedia's WASH-FM in 1968 as morning man. At WASH Eddie led the station as the first break through FM in the US. His morning show dominated the FM dial and went head to head successfully with the old line AM's. In 1983 Eddie moved to WWDC AM as morning man on a big band and nostalgia format. He co-hosted the show with Buddy Rizer and Bob Duckman through until 2000. During his career Eddie Gallaher interviewed and entertained the Stars of the Day, including Ed Sullivan, Bing Crosby, Bob Hope, Al Jolson, Rosemary Clooney, and others. His programs were a must for entertainers passing through Washington. Eddie was a wonderful friend to many, and always concluded each broadcast with "It's nice to know so many nice people". ".................. Mr. Gallaher was the last of the low-key gentleman deejays who dominated Washington's radio scene in its heyday. When he retired from WGAY three years ago, he was the only one from that era still hosting a daily show. He survived major changes in the broadcasting industry, managing to stay on the air for 53 years despite losing vision and mobility in his final decade. Another writer called Mr. Gallaher "a tonic for those who are sick and tired of screaming, cursing morning jocks." Mr. Gallaher said that he attempted in his programs to "talk to one person out there instead of thousands, and I am honest with him." When he wasn't playing music, he would rattle off birthday greetings, horoscopes and consumer tips, or make pitches on behalf of Children's Hospital. He closed every broadcast with his signature phrase: "It's so nice to know so many nice people." Mr. Gallaher also worked for the stations WTOP, WWDC and WASH. He did Washington Redskins play-by-play and entertainment broadcasting for WTOP-TV and a Sunday music program for CBS. A former radio announcer in Oklahoma and a newscaster, disc jockey and baseball play-by-play announcer in Minnesota, Mr. Gallaher began at WTOP in 1946 doing the night show. The next year, he was picked as a morning replacement for the legendary Arthur Godfrey, who was moving to New York to do a national CBS program. Mr. Gallaher retained some of the Godfrey format, interviewing celebrities who were passing through town, in addition to playing music. For a time, he hosted both the morning "Sundial" program and nighttime "Moondial" show. "When stars would come to town -- Jayne Mansfield, Bob Hope, I don't care who it was -- they would line up to be interviewed by Eddie Gallaher," Associated Press Radio anchor Ross Simpson told an Associated Press interviewer. His smooth delivery also made him popular with advertisers. "When he sold food, you salivated," said Willard Scott, weatherman on NBC's "Today" show. Scott and partner Ed Walker hosted the "Joy Boys," a rival morning program that ran on WRC-AM in Washington from 1955 to 1972. After WTOP went all-news in 1968, Mr. Gallaher tried that format for a couple of months, then took his morning show to WASH. He moved to WWDC-AM, which later became WGAY, in 1982. His programs in the final years were co-hosted by the station's music director, Bob Duckman. Mr. Gallaher was born in the District and raised in Tulsa, where he attended the University of Tulsa. He served in the Navy in the Pacific during World War II. His only marriage, to Mary Gallaher, ended in divorce during that period. He was a founding member of the Washington Quarter-Century Broadcasters and a devoted and talented golfer, having started in his youth as an assistant golf pro. His honors included a Lifetime Achievement in Radio Award, sponsored by the March of Dimes.